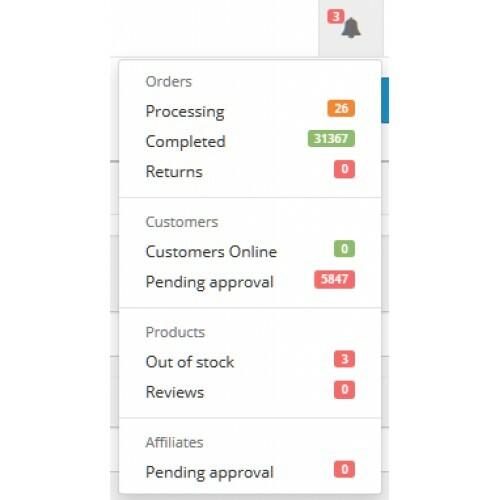 Hi guys need a bit of help or direction, we have over 3 Million products on site and the admin paged takes a ridiculous amount of time to load and slows the site to a crawl and I can only put it down to this, can anyone let me know how to disable the admin search for stock status ? Before you can help us .. Please ... tell us your shop version! Well I posted under 2.0 support as it is under that Version so did not think it would have that much of a impact but its 2.3.0.2 I am running. The differences between 2.0.x - 2.1.x - 2.2.x and 2.3.x are very big! I left the original call to the model, in case you want to use it later again. It's probably an Extension, which can be switched off, or then, get that section removed. Have you additonal modules/extensions installed? Are you using any OCMod or much worse VQMods or both together? Have cleared all cached items? I showed you a working and tested solution, if you are not able to implement ist, you should hire a professional (post a new request in the commercial section of this forum). Yep I have done it correctly and there are 4 Mods installed and don`t use vMod , but they do not affect the Admin panel in that way Sphinx search and fixed IP and fixed shipping. Did most of the work ourselves and also help community by purchasing 2 Mods but saying someone should pay for a opensource support is a little harsh as I would say nearly every one that use this is hoping to sell and make money so why should one be different from the other, its meant to be a community thing. This is a book site so margins are low and considering there are over 20 Million individual books out there and most are print on demand so 80% of that would always be classed as out of stock having on site 3.5 Mil in total is not bad. Maybe I sound a little annoyed but posting on here in the way you did to me saying well you did it wrong, is very patronising and unwelcome way of typing a response to some one. I am sorry to say your info did not do as you might have expected it to do and I also did it on a fresh install and it still did not work so might be a fault on your test environment but because something did not quite work as you typed it out or thought it out in your mind dose not necessary mean the other person is too think to even alter one line of code with 2 forward slashes and adding a 0 in to it deserves the harsh responses. I might not have 4k of posts on here but I am a self trained c# Coder and have over 50 programs out there to my name for warehouse stock management systems to staff tracking products, I might not be 100% up on PHP and Opencart programming but like I mentioned I thought this was meant to be a community area for helping and solving issues for all ? I am not asking help to alter the site to make money just to turn something off in a Admin Panel, P.S. its not a extension I have found to turn it off. Before you are crying here around and telling us how good you are, I have shown you a solution which works. But as it seems, you are not able to implement it. Can happen .. nobody is perfect. But now you want someone to spend his time to do the job for you - for free? In what a world are you living? I am not crying m8e and I am not blagging it all seems to come from your end, I am not really go to post on here anymore as it seems to be a bit toxic towards people asking for a bit of advice "as in first post I asked for direction not the answer", and like you said nobody is perfect and you should look at the mirror on that one as you stating its works fine , it dose not work on my Admin section in the build I have running at moment, so please stop bigging yourself up and if you want to just belittle people on here who ask for some direction and a little guidance that`s a shame.